Please send an email to fireflies@forestoftranquility.com and we will confirm booking on Friday AFTER our weekly firefly and weather check. Although we've seen a few out during the week, they are not as spectacular as we have seen in MID Season. There'll be high temperatures Friday - Sunday, so we may just get a final showing. We suggest you bring a raincoat in case of rain as we are a bio-climatic rainforest however the fireflies will come out in the rain - we just cannot predict how many will come out each night. The forest opens from 6pm - 9pm Fri-Sun and this is the only time you can take a self-guided forest walk now to see this natural Light Spectacular. 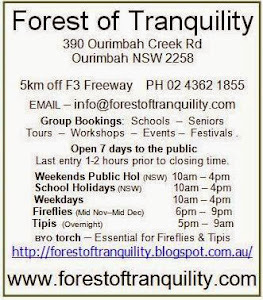 Remember to bring your torch and bushwalking shoes though because the fireflies only come out at dusk. In December, dusk settles at around 8.20pm so we suggest that you arrive at 6pm, take a daylight walk in the forest, come back and have your picnic under the pergolas or on the grass, then pack everything back in your car, collect your torch and be ready to walk back in for the light show on dusk. Oh, and there's a bonus too! This is the peak time to hear the "frog chorus" in full voice each night as well. We look forward to seeing you for our last weekend of our 2012 Firefly Season. If you missed out this year - send us an email and we'll add you to our mailing list for next year's event. Open to the Public: Saturday & Sunday, NSW Public Holidays & School Holidays 11am - 4pm. Forest of Tranquility - Australian Rainforest Sanctuary has recently been acquired by new owners. We are endeavouring to update the facilities and walking tracks throughout the Sanctuary. The facilities are available for group bookings 7 days with prior arrangement with management.